This week we’re joined by Palamedes, a Saracen Knight of the Round Table. He was clever, full of intelligence but subtle in his approach. Palamedes (or Palomides) was the only Saracen Knight to sit at The Round Table, according to the decks creator, John Matthews. His two brothers, Safre and Segwarides seemed to come and go, but Palamedes was a Prince in his own right. It is written (p64) that he was so enamoured with the chivalry of Arthur’s Court, he came to Camelot and was asked to join the fellowship. Seems love didn’t go smoothly for our Saracen, he fell in love with Isolt, Tristan’s love and as such, had a long running rivalry with Tristan over Isolt. 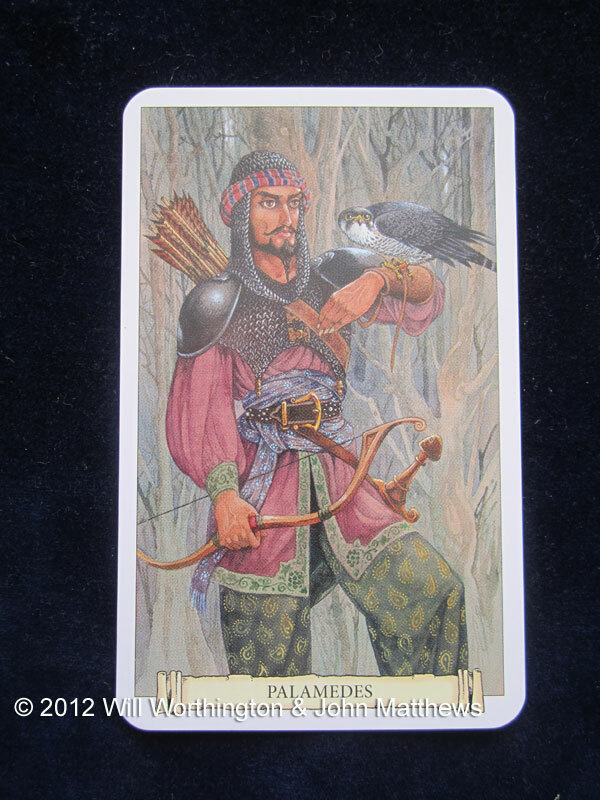 Palamedes is one of the characters searching for infinite and true spirituality. Once he’s started on a quest or an enterprise, it is very hard to discourage him. He understands others and how they think, how they dream and their desires. He is quite skilled in being subtle and his deepest joy is in the skill of the mind. Some of the questions he has for us this week may hurt our little grey cells, but there lies the intelligence. It is knowing that you need his help, and asking for it, that makes this fellow smile. What will be the best resolution to the situation? Are you willing to dig deeply when you need to? Where can you go to find peace? 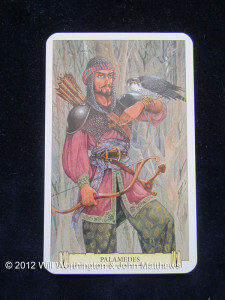 (Remember, Palamedes is a restless soul) Who are your allies and who are your adversaries? Where does rivalry feature in this matter? What lies beneath this issue? What have you dreamed about lately that might influence your decision? Where do you apportion blame? In answering the relevant question, intelligence must be used. It need not be like Sherlock Holmes, it needs to be subtle. Can you be subtle to discern the facts so you may use your intelligence? This one likes Chess, are you able to play along? Deck used is the Camelot Oracle by John Matthews, illustrated and (c) by Will Worthington. Yes, this card is a good reminder to use our wit. intuition is a marvelous thing, but when you blend it with you intelligence you’ll get a real gem! I don’t fully understand Tarot cards. I have only had one reading ever and that was 20 years ago. I do remember the woman telling me something big was going to happen and it had to do with my husband. He was killed in a car wreck about a year later. The way I have been feeling today,I can see a little of what you are saying above. Interesting. I very much like Palamedes! Intelligence (I value that!) and subtlety (we don’t have to go for the most obvious or hit someone over the head with it). I am drawn to his quest for the spiritual and infinite. Your blog is the only exposure I’ve had to Tarot cards, but I find them compelling, and I do relate on a deep level. Perhaps a reading is coming my way! I like this card. It reminds me to focus on how others think and what they want. Well I have a real fondness for the treasure Palamedes brings. He is making me think of numbers and how that plays into our thoughts. Right now we are in a 7 month, the number of intuition and thought. We are called to make choices by looking at all the information that is presented. Perhaps to look back at history and apply a reasoned approach. A perfect time for me to ask myself the tough questions and be ready to act out my decisions. Lovely read as always, Louise. I find it fascinating that numerology and the Tarot work so well together, even though I don’t understand the numerology side as well as I would like at the moment, or as well as you. awesome, I like this card’s energy the idea of searching for true spirituality I wonder how many of us have been and are doing that ? Probably not enough time: If they have, they’re paying for it through the nose for sweet nothing. That seems to be the theme the last few weeks. Dig deep! I love learning about the cards and the characters that are myth or folklore or maybe real! I’m familiar with Tristan and Isolt from the Opera. Tarot and Astrology are so fun. I love the mystery and romance that surrounds them. Your point about ‘subtlety’ is one that made my ‘ears’ stand up.